The Accidental Locavore shows you what to look for in choosing tomatillos. 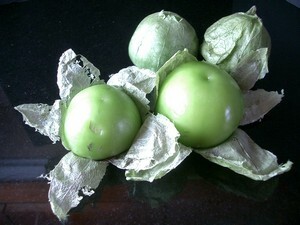 Tomatillos should be smooth, firm and bright green in color. Avoid any that are shriveled or have soft spots. Unlike their tomato cousins, they’re fine refrigerated. To use them, peel off the papery skins and rinse well. Try them in my tomatillo salsa. Next post: Will Your Birthday Cake Outlive You?